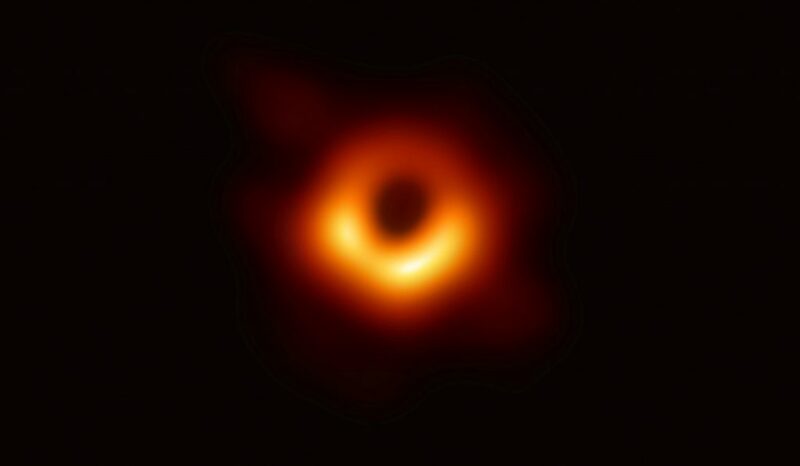 The research was conducted by the Event Horizon Telescope (EHT) project, an international collaboration begun in 2012 to try to directly observe the immediate environment of a blackhole using a global network of Earth-based telescopes. The announcement was made in simultaneous news conferences in Washington, Brussels, Santiago, Shanghai, Taipei and Tokyo. This black hole resides about 54 million light-years from Earth. A light year is the distance light travels in a year, 5.9 trillion miles. Black holes, phenomenally dense celestial entities, are extraordinarily difficult to observe despite their great mass. A black hole‘s event horizon is the point of no return beyond which anything – stars, planets, gas, dust and all forms of electromagnetic radiation – gets swallowed into oblivion. The fact that black holes do not allow light to escape makes viewing them difficult. The scientists look for a ring of light – disrupted matter and radiation circling at tremendous speed at the edge of the event horizon – around a region of darkness representing the actual black hole. This is known as the black hole‘s shadow or silhouette. The project’s researchers obtained the first data in April 2017 using telescopes in the states of Arizona and Hawaii as well as in Mexico, Chile, Spain and Antarctica. Since then, telescopes in France and Greenland have been added to the global network. The global network of telescopes has essentially created a planet-sized observational dish.